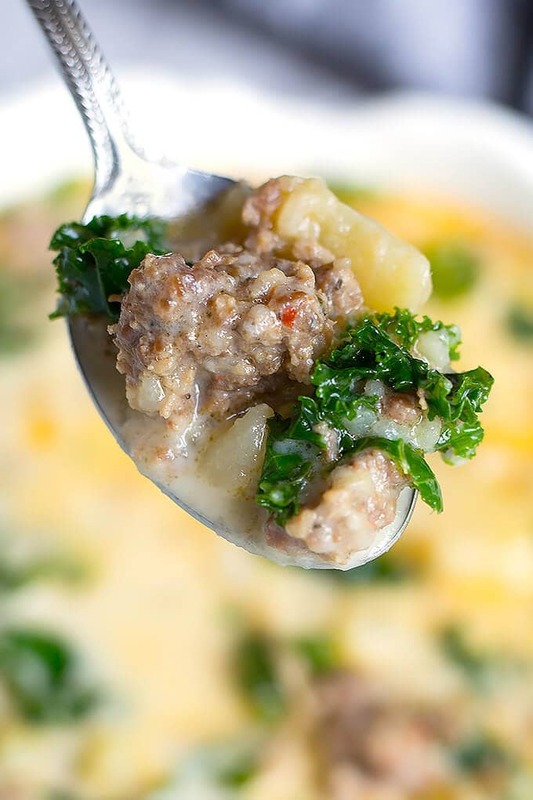 Instant Pot Zuppa Toscana (Sausage Potato Soup) is hearty and full of amazing flavor. One of my family’s all-time favorites! Pressure cooker Zuppa Toscana Sausage Potato Soup is a very rewarding meal to make in your Instant Pot! It was a little cooler today, so I jumped at the chance to make my Instant Pot Zuppa Toscana (Sausage Potato Soup) and share the recipe with you! I started making this about 3 years ago on the stove in my big Lodge cast iron pot. After getting my Instant Pot, I realized it would be a bit faster to cook and it still tastes every bit as good. And it does taste good! 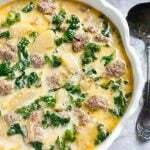 You can vary from the usual way of making Instant Pot Zuppa Toscana (Sausage Potato Soup) by using spinach instead of kale. Paul prefers it that way. I use either fresh baby spinach, or frozen chopped spinach (the kind in the box) thawed, and add it just before the cream. I made this batch with kale because it is a little heartier, and the kale stays fairly firm. Both versions are wonderful! Another change you can make is by omitting the bacon. WHAT?! I used to make Instant Pot Zuppa Toscana (Sausage Potato Soup) without the bacon all the time. Then we found a local butcher who smokes his own smoky bacon. I made a batch with a few slices of that smoky bacon, and that was it. Took this already amazing soup right over the top and into the clouds! I highly recommend it. I mean, bacon. How bad can that be? 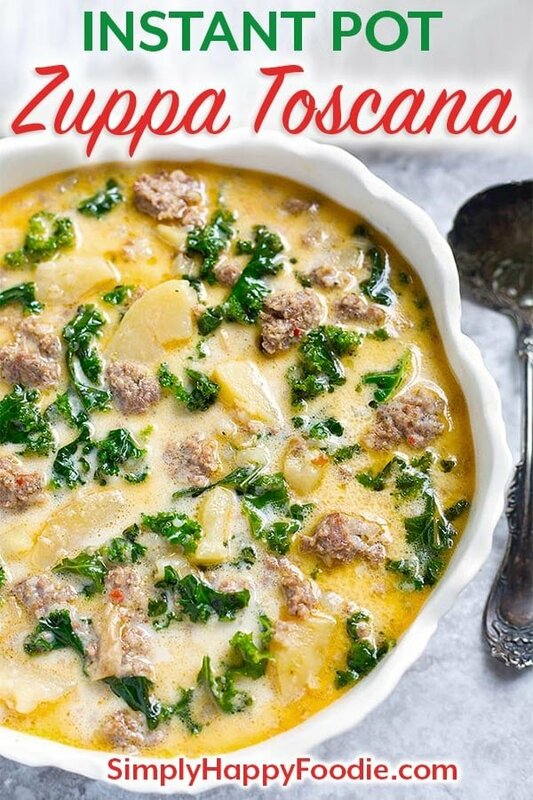 Either way you make it, you will end up with a rich, hearty, and very satisfying, rustic Italian inspired Instant Pot Zuppa Toscana (Sausage Potato Soup)! 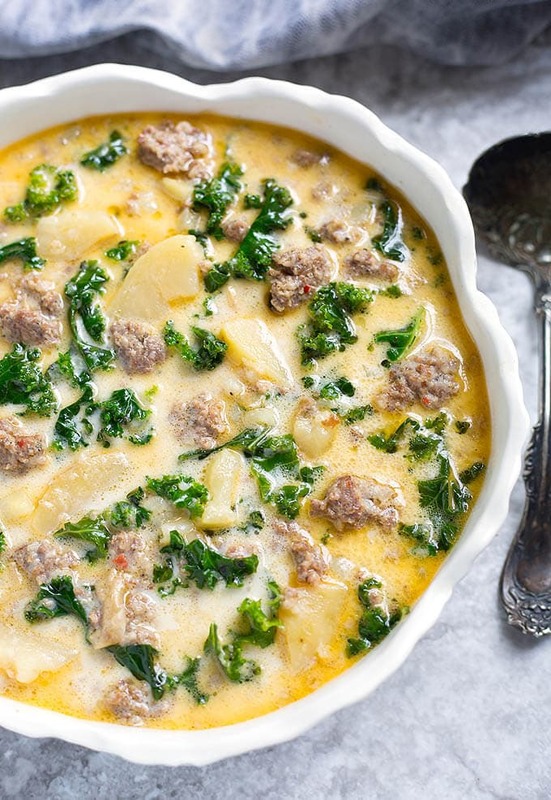 Instant Pot Zuppa Toscana (Sausage Potato Soup) is hearty and full of flavor. One of my family's all-time favorites! Very simple to make in your Instant Pot! Turn the Instant Pot to Sauté mode, and add the chopped bacon. Cook, stirring occasionally, until the bacon renders out most of its fat. Remove and set aside. Add the sausage and brown it, stirring a few times. If you can get a good browning on it the flavor will be even better! Spoon out all but 2 tsp of the fat (enough to cook the onions). Add the onions, stir them in. When the onions start to look translucent, add the garlic and stir. Pour in the broth, stirring, and make sure you scrape the bottom of the pot to get up any brown bits (deglaze). Add the potatoes, and add the bacon back in. Check to make sure the contents don't go over the Max Fill line marked on the inner liner. Set to Manual (or Pressure Cook), and choose 5 minutes* (High Pressure). The pot will take several minutes to come to pressure. Do a controlled Quick Release for the rest of the steam, and when the pin in the lid drops, open the lid. Add in the kale, (or thawed spinach, if using) and stir well. Cover and let heat through for 5 minutes or so to soften the kale. If using spinach, just stir it in and proceed to the next step. *Cook time is time the soup cooks once it is at pressure (and time sautéíng). Full pots of soup can take several minutes to come to pressure. **You can use spinach in place of the kale. Use fresh baby spinach or thawed frozen chopped spinach. You shouldn't need to add any salt to this recipe as the meat has plenty in it. Some pepper might be good, but it has a nice little kick of spice if you use hot Italian sausage, and you may not need it. I was inspired by my visits to the Olive Garden to make this recipe, though I usually use spinach and not kale. This was a huge success for our dinner tonight. Thanks so much for a great recipe! I didn’t have energy to thaw bacon but the rest was pretty true to the instructions. So flavorful! I also used frozen kale. It worked great. I’ve made several versions of this soup and this might be my favorite. Hi Christy! I’m very happy to hear how much you liked this soup! And yes, even without the bacon it is so flavorful! I appreciate that you took the time to comment, and to let me know how you liked it! Thank you! I made this tonight for dinner and it was so delicious! Only adjustment I made was to deglaze the pot with a little bit of white wine before adding the broth. Thanks for the recipe! Hi Shannon! The wine sounds like a nice addition. Functional for the deglazing, and delicious! Thank you for taking the time to comment. I’m happy that you liked this soup! Would this recipe be okay if I used 2% milk. That’s a lot of cream for us but would love to try it. Yes, I think it will be fine. Great flavor and extremely simple to make. Definitely keeping this for another soup weekend. Hi Tiffany! Thank you for the nice review! I’m happy that you liked it! This is delicious! We will be repeating this recipe very soon!! Hi Mary! I’m so glad you like the Zuppa Toscana! I really appreciate your review. Thank you! Pardon my ignorance, (I’m new to pressure cooking) but is the bacon supposed to be pre-cooked, or does it cook in the soup? I would be using beef sausage and turkey bacon because we don’t eat pork. Thanks! Hi Stacey! The bacon goes in right before the onions, and cooks with them. Just keep an eye out for how much fat the beef leaves, and spoon some out if it’s more than a few teaspoons. The turkey bacon won’t have much fat, so you will be fine there! I hope you enjoy it! Could you please include a nutritional breakdown? Thanks! Hi Jennifer, I have recently acquired a nutrition info addition. I’m learning how to use it and it will be installed soon! Thank you for the request! Can’t wait to try this! Do you peel the potatoes before slicing? Hi Laura, I hardly ever peel my potatoes. Definitely not for this soup! Simple and delicious! Used frozen spinach and only had 3 potatoes on hand! Thank you for a new supper staple! Thank you for this recipe! It was delicious! I made this tonight and my entire family including two kids under 10 ate double servings! Served it with tons of grated cheddar cheese (just because that’s what my kids love) and topped each bowl with a piece of sourdough toast. It was awesome and I think it’s going on heavy rotation at our house! Side note: I accidentally bought half and half because the two cartons looked exactly the same at the grocery store, and it worked just fine. Hi Neena, how great that even the kids loved this soup! I’m so happy that this will be a part of your family’s rotation! Thank you for the review! I’m guessing you slice the sausages before browning? Or do you do that when you take them out? Hi Heidi, if you want to use link sausage, then yes, I would slice first. This recipe is created for ground sausage, and I like the texture in combination with the other ingredients better. Tip: Sometimes our store doesn’t have fresh ground italian sausage just the fresh uncooked linked italian sausage. I just cut off end of each link & remove skin/casing by squeezing or pealing it back/off. Just takes a couple minutes & saves me a trip toting 5 kids to/thru different store. Each of our kids ages 1-12 love this recipe…even the very very picky eater that doesn’t do spicy foods at all (won’t even eat a taco due to spicy) & would eat PB&J every meal. Thank you for sharing recipe. Hi Tiffany! Thanks for the great tip! I’m so glad that you and your littles enjoyed this soup! Thank you so much for leaving a review! The soup came out great, but I do have one question. The part where it says to remove all but 2 tsps of liquid then saute the onions, does that mean take out the sausage as well? If so then it would be nice to notate that and when to add the sausage back. Thanks so much! Hi Ryan, I’m glad you liked the soup! You do leave the sausage in. You don’t HAVE to spoon out most of the fat, but I felt it was just a bit too greasy if left all in. Personal preference, but this method works best for me. I have quite a lot of kale in my garden right now and was wondering what I was going to do with all of it. A friend suggested the Zuppa and I loved the idea! Only problem is, I started a low carb diet a few weeks ago and potatoes are a no-no. I decided to try using a head of cauliflower broken into bite sized pieces. I didn’t alter the rest of the recipe at all. This is going to be my go-to recipe! The cauliflower was great and I feel didn’t take away from the full-bodied taste of the soup at all! Someone else told me that they used cauliflower with great results, so I’m happy to know you did, too! Someone else used sweet potatoes, and that also sounds good! Thank you for your review! Can I make this soup one day ahead? Wondering if the day before, I stop after step 14 and refrigerate. Then reheat the next day and add kale/spinach then the cream. I don’t want the spinach/kale to be “soggy”. Will this work, or do you have a better suggestion? Hi Laurie, yes, that is how I would do it. The leftovers will reheat nicely if you don’t boil it too hard. Enjoy! How much is a serving? 1 cup 1.5 cups? 1 cup is how I figured it. Thanks for sharing, I love this soup. Sometimes I use precut bits of pancetta instead of bacon. I read the comment about reheating. Would you store the soup in the fridge after letting it cool off and then put it back in the instant pot to reheat? Is that manual for 2 or 3 minutes? Awesome recipe. Tastes just like the restaurants. Easy to make also. This will be a staple for fall and winter. Thanks, James! I’m so glad you liked it! Yum. Just made it for my family. I used Chicken spicy Italian sausage and it came out great. Quick and easy for a weeknight dinner. Everyone added salt and pepper to their liking. We’ll make this again. Thank you! Third time I’ve made this! My family loves it! I did add mushrooms! Thank you! This looks so good. What size instapot is it made in? I have a 3 at. Do I just cut in half? This is made in a 6 qt. Yes, cut in half for the 3 qt. I hope you like it! This recipe is perfection! Have made with and without bacon, both ways are delicious but I think the bacon does add something extra. Thank you for sharing, this will be in heavy rotation! That’s great, April! So glad you liked it! I’m planning on making this but I only have a basic crock pot with only low and high. Settimg Do you have instructions for cooking this way? Thanks! This recipe was really good. My family loved it. I didn’t have spicy sausage so just used regular and added some black pepper at the end and it had the perfect kick. Thanks for the recipe! That’s great, Sarah! I’m so happy that your family loved this soup! Thank you for your review! I made this with kielbasa and red potatoes. Also I didn’t have kale or spinach on hand. It came out great! On my second day of eating this soup for leftovers. I also added a little Cajun seasoning to the pot before starting the pressure. I highly recommend this recipe! Yum! Sounds delicious! I really like the adaptations you made. I made this soup tonight with just a couple changes….I didn’t have chicken broth so I used Vegetable base (better than bullion brand) and I also threw in sliced baby Bella mushrooms at the same time as the spinach. The sausage I used was homemade venison sausage (hubby got one this year!). Talk about delish! My husband raved and had seconds and my 3-yr old finished her dinner in reasonable time. I’ll definitely be making this again! Ong!! This soup was amazing! I was too lazy to defrost bacon..and I used chicken sausage…and wait for it….RADISHES instead of potatoes because we are low carb. Everyone LOVED it…even my very sometimes picky MIL! Going in our regular rotation for sure!! Awesome! Thank you! Radishes is such a creative idea! Hi, the recipe sounds delicious! Do you have any suggestions for a substitution for the cream? I can’t eat dairy so I try to avoid it. Thanks! You can use unsweetened almond milk or cashew milk. Even coconut milk, though that will alter the flavor (I would test a small amount in a separate bowl of the soup). Some people don’t add any at all. This soup is a family favorite! Even those who domt like Kale, we all looovvee it! It is just so tasty and falvorful! This is always one I go back too!!! That’s great, Mackenzie! Thank you. So glad you all liked this recipe! Hi Sarah! “Several” is a purposefully vague amount of time as the timing will vary based on different factors. Namely, weather or not you preheated the broth/meat mixture before adding the potatoes and sealing the pot. May I ask what language specifically was confusing as I would like to clarify? I do use an Instant Pot® brand pot. Hello, this looks fantastic. I am hoping to make it tonight or tomorrow. Does it matter what kind of potatoes and onions are used? If I make it, do you think it will keep well for a while on “warm” setting with the glass lid? Use any kind of potato or onion, it will be delicious! It keeps well on warm, the potatoes may soften a bit more. This soup is divine. I drain the cooked sausage and replace the pork fat with olive oil, and it doesn’t affect the flavor at all. I also offer hot cream when I serve it — that way people can add it to taste, and I can freeze the leftover soup (if there is any!). Our favorite accompaniment is fresh baked no-knead bread. Thanks for such a wonderful recipe! Thank you for this recipe! I am without a kitchen right now (remodel! ), so I’ve been using my electric pressure cooker several times a week. I followed your recipe and my husband, who is picky about eating GOOD, FLAVORFUL food, loved it. He said it may be the best thing I have ever made. I used spinach in it tonight because that is what I had on hand, but I will probably try it with kale next time. Other than that, the only other changes I made was leave out the oregano (again…picky husband!) and added some salt, pepper, and red pepper flakes. I also added some Parmesan cheese to the top when serving. My only issue with it was that I would have liked it thicker. But it was delicous and it will definitely be made again. Thank you!!! Thank you, Jennifer, I’m so glad you and your husband liked this recipe. For a thicker soup you can try mashing some of the potatoes, or making a slurry with potato starch and cold water. I made this tonight and it turned out amazing. I would give it 10 stars if I could. It really hit the spot in the need for winter weather comfort food. I’m a vegetarian so I dropped the bacon and swapped out the real sausage for Field Roast Italian Sausage. Really delicious. It was just me eating it and it made more than I can eat between today and tomorrow. Any experience freezing it? Hi Elissa! I’m so happy that you found a way to make this recipe fit your diet! As for freezing it, I haven’t. I would try a quart freezer baggie and see how it does. This is one of those soups we never have leftovers of! Definitely a keeper at our house! So happy it turned out delicious! I substituted the kale for spinach since we are spinach lovers. Yumm!! Thank you, Anna. I’m glad you like this recipe! I have made this several times and my family loves it. I used ground turkey and added Italian sausage spices. We are also dairy free and I read somewhere to puree a can of white beans to substitute for the cream. It works to add creaminess to the soup. This is a great recipe! I used frozen kale as my friend gave me some which needed to be used from last year’s gardening. It’s a great soup to be made in the camper too. The aroma has the entire campground wondering who is doing the cooking. ; ). I made a romaine wedge salad with bacon, red onion and topped with homemade blue cheese dressing as the side. What a great meal. I printed this recipe off and it will remain in both my home kitchen notebook and the camper. Thanks!! Thank you, Teri! So glad you like it!